we sure love it! i LOVE those aliens! i hope your package arrived today - i swear i sent it priority! wow, what lovable aliens. 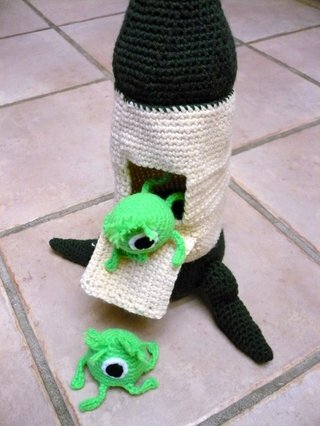 i thought the rocket was a mouse house something like that. good job. That's very cool. I love those Aliens! how creative!! her kids should be thrilled! This is so very cute!!! I love it! The boys would go crazy...did you make the pattern?? Hey Michelle! You did an awesome job! I love the fact that you made it your own!! Keep on hookin'! I really like this project. So much that -if it's ok with you- I might give it a try, as a present to my boy Felipe. Thanks for this beautiful and inspiring place to visit.